Screenshot from the interview with reporter David Delos, recorded by France 2. TV5Monde, which was the victim of an Islamic State cyber-attack, has accidentally exposed social media account passwords to its viewers. An interview was being filmed in the newsroom, where passwords were left hanging on a wall for all to see. In the wake of the recent mass cyber-attack, French media spoke to employees of the television station to learn how they had been affected. However, the cameraman in one interview forgot one tiny detail – to check the backdrop behind one of the people being interviewed. 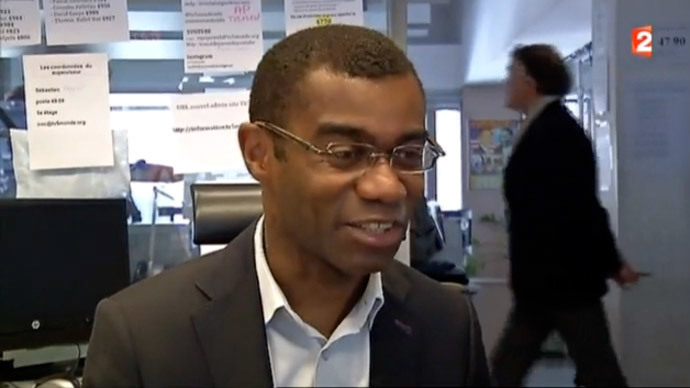 The interview with reporter David Delos, which was being recorded by France 2, revealed details about TV5Monde’s social media accounts, which had been stuck onto a wall. These included account names and passwords, which were in full view, behind the back of the journalist who was being interviewed. Passwords on the wall... That's why we can't have nice things. Although the picture quality was poor, one Twitter user ‘pent0thal,’ claims he was able to decipher the password to TV5Monde’s YouTube channel, which according to him, was “lemotdepassedeyoutube", translated as "thepasswordforyoutube" from French. Well, the TV5Monde YouTube channel password was "lemotdepassedeyoutube" In English "thepasswordofyoutube"
After watching other reports, the Twitter user discovered that the French BFM TV channel also captured an image of another note allegedly containing private account information of a TV5Monde employee. French investigators launched a probe into the cyber-attack carried out by hackers claiming to be supporters of the Islamic State (IS) late on Wednesday. French media reported on Thursday that the attack was “well prepared beforehand”. During the attack, a total of 11 channels belonging to the TV network were blacked out for about three hours. The channel’s website and social media accounts were infiltrated by pro-IS photos and slogans such as “Je suis IS” ("I am IS"). The director of TV5Monde, Helene Zemmour, said on Thursday that this was the biggest cyber-attack the network has experienced in the past 30 years. The IS supporters also claimed that they published confidential documents on the hacked TV5Monde's Facebook page. These included ID cards and other information concerning the relatives of French soldiers involved in anti-IS operations in Iraq. "None of these documents mention the identity of French soldiers or of their families," the ministry said in a statement. "The defense ministry categorically denies that those who attacked TV5Monde's broadcasting capabilities published defense-related confidential documents." French authorities said the attack was a “terrorist act.” They have also urged the media to stay alert. In March, French security officials warned that more jihadist attacks are expected in the country as the terrorist threat has “reached a level without precedent.” Islamic militants have been targeting the country in retaliation to France joining the US-led coalition’s air strikes against IS militants in Iraq.